PLEASE NOTE: The currency in Peru is the Peruvian New SOL (I will refer to them as P$s). At the time of writing, US$1 = P$3.36. We (my sister Diane, my brother-in-law Jeff, and I) had completed our tour of Machu Picchu and The Sacred Valley. And, our tour of Lake Titicaca. We ended up in La Paz, Bolivia. 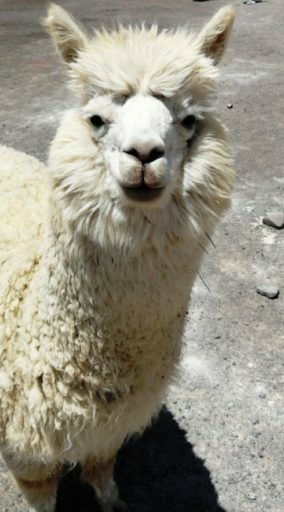 We had already used Peru Hop to get from Cusco to La Paz. 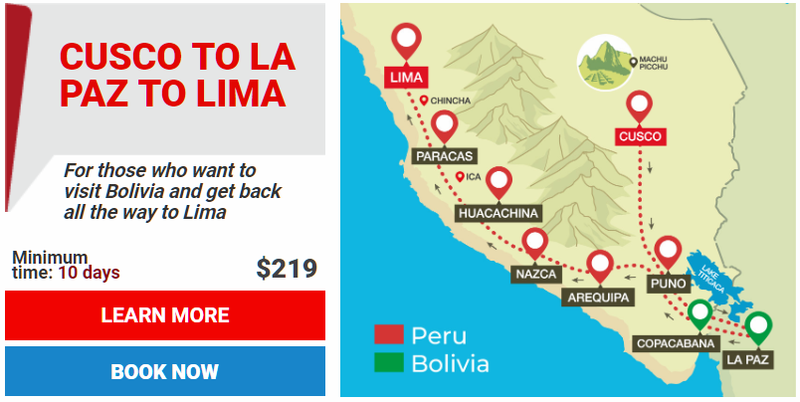 We paid US$219 each for the ticket from Cusco to Lima via La Paz. This was discounted down to US$209 because there were 3 of us. Peru Hop have a nice Double Decker bus between Cusco and the Bolivian Border. … and ‘normal (2 by 2) seating upstairs. This, invariably, means that there is an even bigger ‘scramble’ to get onto the Double Decker … everybody wants to get a seat downstairs! The Double Decker bus has a toilet – but ONLY FOR LIQUIDS! On all other sections they, usually, use a standard Single Decker bus. The Single Decker bus (often) does not have a toilet. On-line travel date booking and adjustment. For these ‘extras’ you, effectively, pay about (I would say) a 33% price ‘premium’. As aforementioned, we arrived in La Paz on the Single Decker Peru Hop bus from Copacabana. We wanted to stay in the main tourist area / historical centre near the Witches Market. We booked ourselves 2 Double Rooms with Private Bathrooms at the Belmont Hotel. We paid US$20 per night per room. The Peru Hop bus doesn’t arrive in La Paz until after 10:30pm at night. We emailed the Belmont in advance to inform them of our late arrival. It made no difference … when we arrived they had already given our rooms to other people! They tried to put us into lesser rooms with a shared bathroom. Eventually, we managed to get rooms with a private bathroom. I do not recommend the Belmont. The rooms looked nothing like the pictures displayed on the internet. The rooms were dirty. To add insult to injury, the ‘included breakfast’ was almost non existent. They made sure that they replenished the stocks as slowly as possible … so that people ate as little as possible. On my previous trip to La Paz I stayed in Hotel Avenida. This is a much better ‘budget’ option than the Belmont. I paid US$18 for a Double Room. The historical area and the Witches Market were disappointing. Calle Jaen was nice … but, it is all over in 2 minutes. Simply put … La Paz is busy, dirty, and ‘uninspiring’. One of the best things to do is to jump on the Cable Car. There are several ‘colour coded’ sections. Each section costs BOB3 each (about US$0.45c). 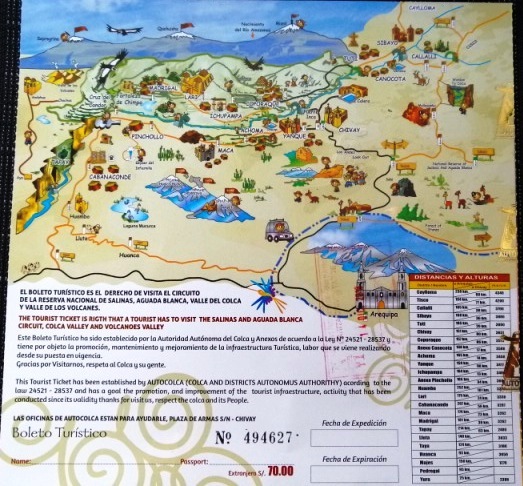 Alternatively, you can buy an eCard for BOB30 that contains BOB15 in travel credits at discounted rates: this would be a better choice if you plan to stay in La Paz a few days and get around on the Cable Car. Soon, these sections will join up to form a complete ‘loop’. They only have the ‘grey section’ to complete that connects Quana Pata to Jach’a Quathu. The Cable Car is a good way to spend a day. Jump on and off and have a good look around. PLEASE NOTE: If you get off in the middle of a section, you cannot get back on using your previous ticket. You have to buy another one for BOB3 – even if you only have 1 more stop to go. From El Alto, you get a fantastic view of La Paz city. 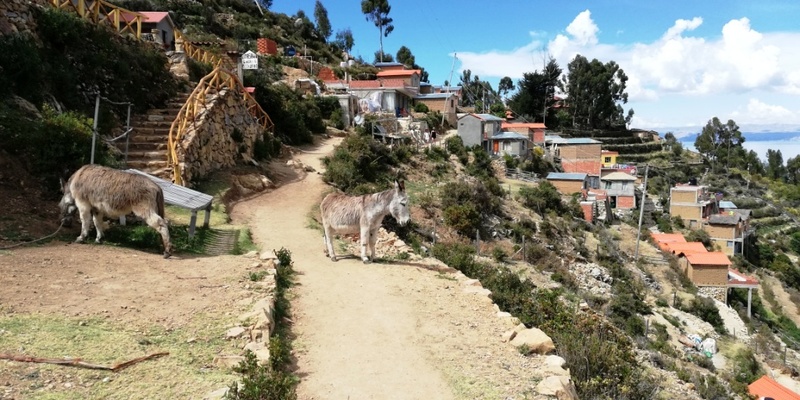 More adventurous people, like me, can walk back to town from El Alto down steep steps and steep side roads. But, for your safety, only do so during daylight … you walk past lots of dogs that will get increasingly territorial as night falls … and, you walk through some ‘dodgy’ suburbs. Stop at the General Cemetery on the Cable Car Red Section. And, it is definitely worth a visit. Don’t waste your time in La Paz. Spend a day on the Cable Car jumping on and off to see the best bits … then, get out as fast as you can. Peru Hop pick you up from your hotel between 6:30am and 7:00am in the morning. About 1 hour out of La Paz you stop at a roadside cafe so that you can use the toilets and purchase Breakfast. Three hours out from La Paz you stop at Tiquina. In Tiquina you have to get off the bus and catch a ferry. The bus arrives on a separate ferry later. Passengers are not allowed to cross on the bus. Several years ago a ferry capsized and some people drowned. There are toilets (BOB1), shops, and street food stalls. The whole process takes about 30 minutes. You get back on the bus and arrived in Copacabana at about 11:30am. Peru Hop do not drop you off at your hotel. They only stop at the White Anchor on the waterfront. We booked ourselves into 2 Double Rooms with Private Bathrooms at the Hotel Estelar del Titicaca. We walked in off the street and negotiated a cash price of BOB600 (US$87) for a Double Room and BOB400 (US$58) for a Single Room. The Single Room was really a Double Room at a single occupancy rate. Both came with a balcony. Both included an American Buffet Breakfast. I had been to Copacabana previously. On that occasion, I booked myself into Hostel Sonia. It was about 700 metres from the waterfront. This would put many people off but it was good value for money. I paid US$12 for a Single Room. It came with a Private Bathroom. Stay away from the area around Plaza Sucre. This plaza is where all of the buses come and go from: it is busy and noisy all day. The town is very pleasant. And, not as ruined by tourism as you might expect. … and there is a pleasant market area. The main street down to the waterfront is riddled with nice tourist cafes and bars. And there are several more on the waterfront. Some of which have Happy Hours and terraces to attract you at sunset. 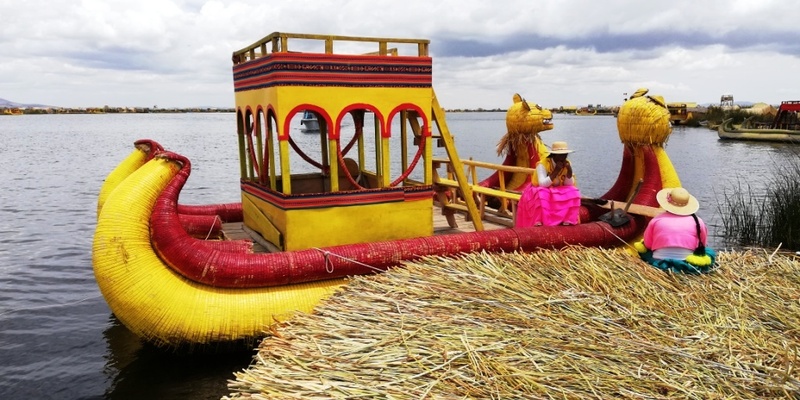 Read my blog about Lake Titicaca. 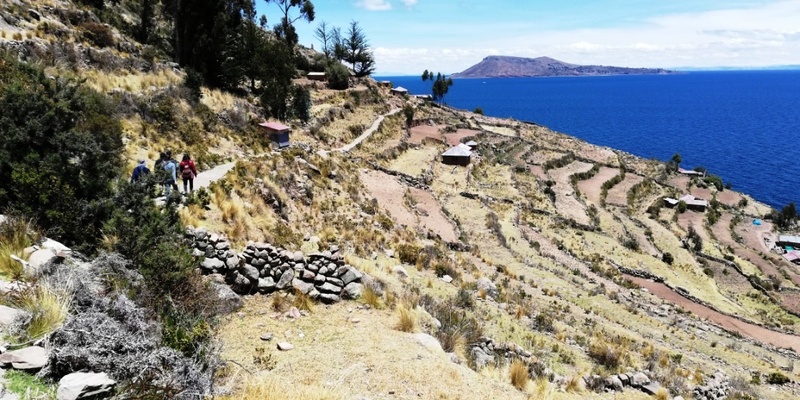 In this blog, I discuss the 1/2 Day Peru Hop Tour to Isla Del Sol. 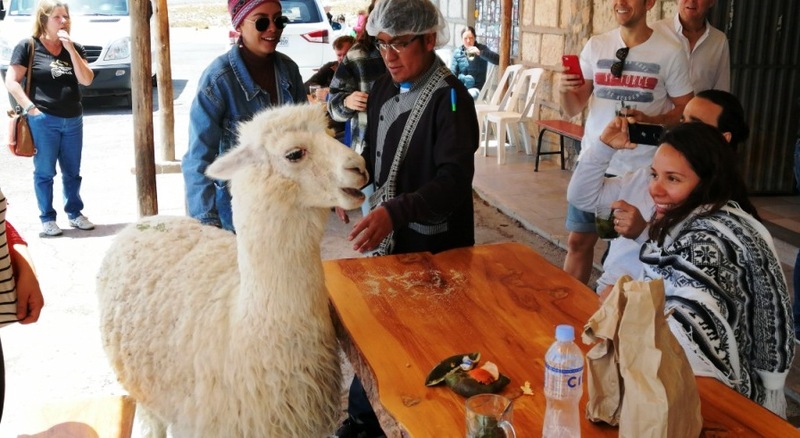 Don’t do the 1/2 Day Peru Hop Isla Del Sol Tour. Instead, stay 2 nights so that you can do a full 1 Day Tour of Isla Del Sol. Only do Isla Del Sol. Including Isla Luna takes up too much time and isn’t worth it. 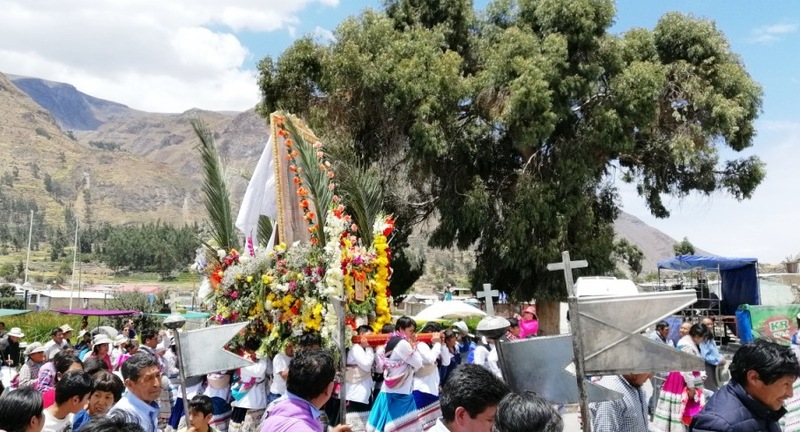 You can get a 1 Day tour for the same price that Peru Hop charge for their 1/2 Day Tour … but in the 1 Day Tour you get much more time on the island. The Single Decker Peru Hop bus leaves Copacabana at 5pm and arrives in Puno at 8pm. From Copacabana it is only about 15 minutes to the border. You get off the bus at Bolivia Migration, get stamped out, walk 200 meters into Peru, and get stamped in at Peru Migration. You, then, get onto a new Peru Hop bus. This bus is a Double Decker that goes on to Cusco via Puno. As aforementioned, it is a ‘scramble’ to get the Business Class seats downstairs. In my humble opinion, Peru Hop should reserve the Business Class seats for those continuing overnight to Cusco … but, they don’t. We managed to get 3 Business Class Seats by sending my sister ahead to get to the front of the queue whilst we sorted out the bags. Read my blog on Lake Titicaca. On our way from Cusco to La Paz, we booked 2 nights at the Suites Antonio. Again, read my blog on Lake Titicaca. 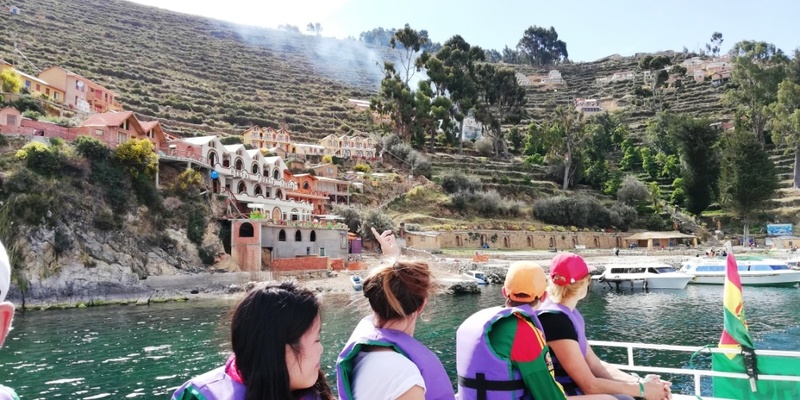 On our way from Cusco to La Paz, we booked a 2D/1N ‘Three Island Tour’ with Bolivia Hop for US$37 each: Floating Islands, Amantani Island, and Taquile Island. On this occasion, we were not staying in Puno but continuing on the Peru Hop Bus to Arequipa. The Peru Hop Bus arrives in Puno at 8pm. Those continuing on to Cusco and Arequipa get off for Dinner. Our guide took us all to a cheap restaurant. We ate a 3 course meal for a reasonable price of P$20. We were back on our bus (in the same Business Class seats) at 9:30pm. The Double Decker bus continues north to Cusco. Those going to Arequipa stay on the bus until it meets another Peru Hop Bus coming south from Cusco to Arequipa. The buses pass each other at about 1am in the morning. Ours met near Pucara. We transferred to our new Single Decker Bus on the side of the road. We arrived in Arequipa at 5:30am. Peru Hop organised a taxi (at their cost) to take us to our hotel. We booked 2 rooms at Hostel La Reyna. Di & Jeff booked the Deluxe Double at US$22 per night including Breakfast. I booked the Deluxe Queen at US$13 per night including Breakfast. My room was very ‘simple’. How they could put the word ‘deluxe’ at the front of its name was beyond me. But, it was good value for the price paid. 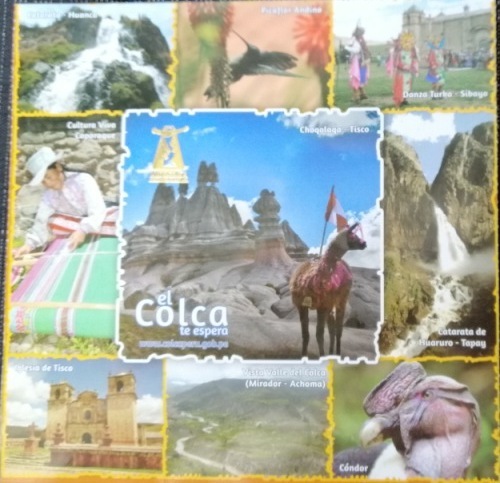 Our plan was to do the 2D/1N Colca Canyon Tour. So, we booked 2 nights each with 1 night in between so that we could leave our main luggage at the hotel whilst we did the tour. Our rooms included Breakfast. Because we were leaving before Breakfast the next morning, they were kind enough to let us have our free Breakfast on the morning that we arrived … as we waited for our rooms to become available. Arequipa has a beautiful historical centre. For the price of a ‘tip’ you can take a walking tour. You see most of the main central sites. We were in Arequipa to do the Colca Canyon tour. We shopped around and finally negotiated a price of P$150 each. In addition, you need to pay a P$70 Park Entrance Fee. You, typically, go in a 16-seater minivan. We were picked up from our hotel at 7am. It is a long drive to the canyon. We stopped for refreshments on the way. Which included meeting Larry the Llama … a new member of the tour. And stop at ‘miradors’ with views of several volcanos. You travel a good 4-5 hours. Before stopping for an excellent (included) buffet lunch. After lunch, I took a (free) trek with our guide to a pre-incan graveyard. It was a bit of a climb but very ‘doable’. We finally checked into our accommodation which was basic but sufficient … as was the Breakfast. That evening, we went to the village square for a beer and a simple dinner. After Breakfast we were back on the road. We stopped in a small village to watch some local children dancing. And, finally reached the start of Colca Canyon itself. Colca Canyon is the 2nd deepest canyon in the world. It is deeper than the Grand Canyon in the USA. What the Tour Agents fail to tell you is that you don’t actually go to the deepest part. On our way back to Arequipa, we stopped off in a small village. We were lucky and caught a church procession. You can easily and happily spend several nights in Arequipa. It is a picturesque town with a lovely historical centre. 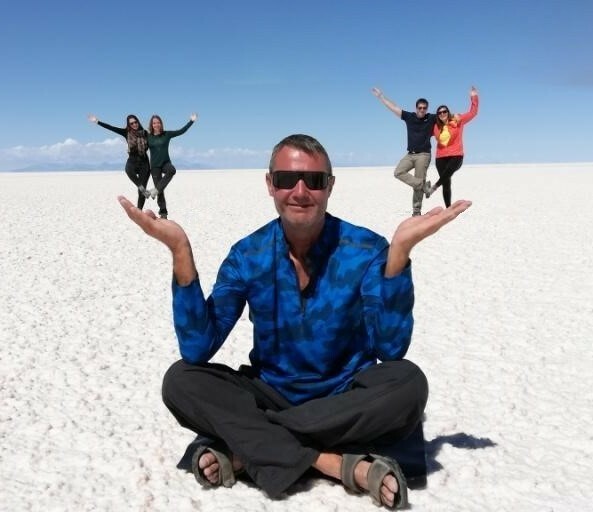 Fit in a Colca Canyon trip whilst you are there. Try and do at least the 1 night trip … going there and back in 1 day would be very tiring. You leave Arequipa at 5:45am and don’t arrive in Nazca until 4pm. We had to be ready outside our hotel at 5:15am. We were picked up by a taxi and taken across town to the bus pickup point. The bus was late … we were connecting with the bus that comes down from Cusco. In my opinion, this is the worst part of the Peru Hop trip. It is a boring journey … I don’t know why Peru Hop don’t do an over-night option. Peru Hop do not recommend staying in Nazca … they suggest that you continue on to Huacachina (arriving there at 6:45pm) but we decided to stay in Nazca for a couple of nights. We booked 2 Double Rooms with Private Bathroom at La Maison de Lydia. We paid US$19 per night per room. It had a Private Bathroom. It was on the edge of town so we needed to catch a taxi to/from the town centre but this small cost was more than compensated for by the great price of the rooms (compared to costs closer to the town centre) and the nice dipping pool offered at the hotel. 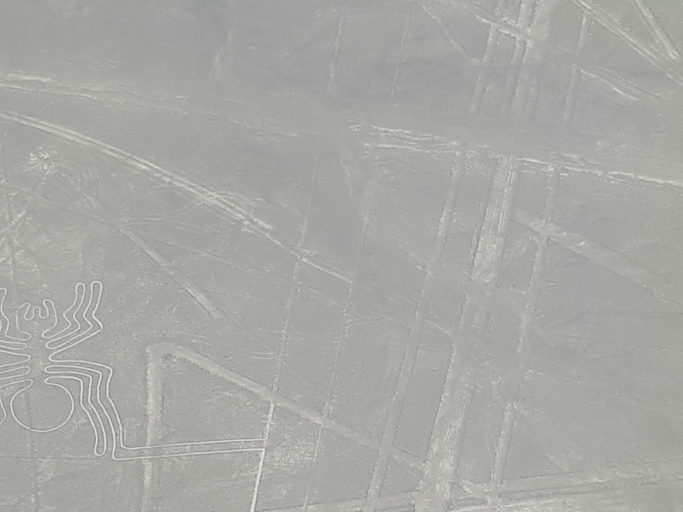 We were here to fly over the Nazca Lines. It is important to choose a company with a good safety record. We booked online with AeroNasca and paid US$80 each. You pay another US$10 Airport Tax on top of that when you arrive at the airport. You are advised to book a morning flight … the earlier the better … apparently, the wind starts picking up during the day … which can make the flights increasingly uncomfortable (and, sometimes, dangerous). Our plane took 6 passengers. The flights all follow the same route. As the pilot flies over each one, he banks twice so that both sides of the plane get a good view. It is surprisingly difficult to get good photos of the lines. The windows of the plane seem to make focusing difficult … it is, also, very easy to miss the lines that you are aiming for! Take a taxi 15kms out into the desert to the Chauchilla mummy Cemetery. Entry is P$8. All of the graves have been robbed. But many of the mummies have been left in situ. There are about 12 open tombs to see. 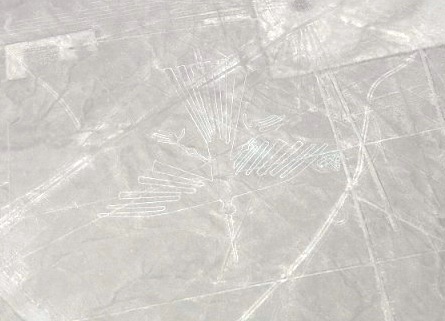 I see no reason why you shouldn’t stay in Nazca for 1 night. You can go out into town on your first evening. Next morning you can do the flight. Afterwards, you can do the Cemetery. If you do a very early flight, you could also fit in a trip to the Cahuachi Pyramids … and still be back in time to catch the Peru Hop bus to Huacachina at 4pm. You re-connect with the Arequipa to Huacachina Single Decker Peru Hop bus at 4pm. They only drop off and pick up from Mom’s Cafe. It is a short 3 hour trip from Nazca to Huacachina. 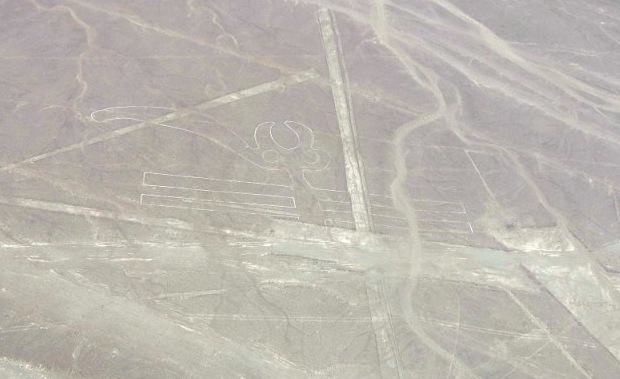 En route, you stop in the Nazca desert. 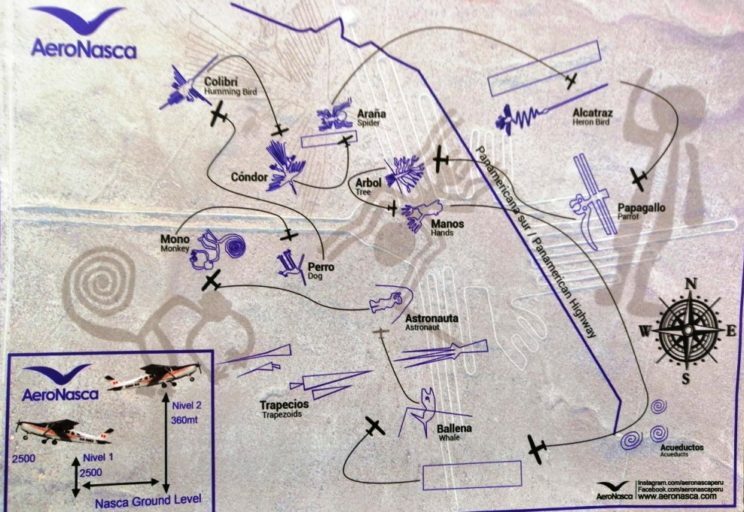 Where you can get a ‘peak’ at 3 Nazca Lines from a free viewing platform. In Huacachina, Peru Hop only drop off and pick up from outside of the Wild Rover. We wanted to be close to the oasis … preferably with an oasis view … so we booked into the El Boulevard. We booked 2 Double Rooms at US$27 per night per room. The bed came with a mozzie net. You can walk around it all in less that 1 hour. Just chill and enjoy … but you really should climb the dunes at least once for a sunset. Your Peru Hop ticket includes a free 2-3 hour trip to a Pisco Vineyard. Pick up is from outside of the Wild Rover at 11:00am each morning. Be there 15 minutes earlier. It is a short drive out to the vinyard where you get a short tour. Which finishes with a minimalist tasting of 3 cheap wines. If you want to taste Pisco, you need to pay for it. It’s a bit of a ‘trap’ really … but free if you have nothing else to do. This 2 hour trip costs P$50 through Peru Hop. Pick up is at 4pm from outside of the Carola Lodge. You walk up the dunes to join the buggies. Each buggy takes 9 people. You are taken on a fast, scary, buggy ride through the dunes. You stop first at an easy dune for the sandboarders to get the feel for it. Why rush … spend a couple of nights in this amazing location. You arrive late in the evening anyway. The Vineyard tour is very ‘ho hum’ but you should definitely do the sandboarding trip – even if you just stay in the buggy. The Single Decker Peru Hop bus leaves Huacachina at 7:00pm from outside of the Wild Rover. The bus is coming through from Arequipa, so there are already people on the bus … and, the usual ‘scramble’ to get on first to get the best seats. It is a short journey. You arrive in Paracas at 8:30pm. Peru Hop only pick up and drop off along the main road. We booked ourselves into the Icthus Paracas Hotel. We booked 2 Superior Double Rooms at US$25 per night per room. … these were smaller and not as nice. They came with Private Bathrooms. Breakfasts were another US$3 per person per day but, because of the mix up with the rooms, we negotiated free Breakfasts. There is nothing special about the town but it does have a nice waterfront ‘scene’. There are several bars where you can eat, drink, sit, and people watch. Some have Happy Hours with, say, 2 large local beers costing P$18-20. Peru Hop offer a free trip to the National Park in the desert. Pick up and drop off is from outside of Hotel Residential Los Frayles at 11am. The journey is about 30 minutes each way. If you fancy a swim, bring your costumes. There are 2 beaches to choose from. You stay for about 1 hour. Returning to Paracas by about 1pm. We went to Paracas to see Ballestas Island. Peru Hop offer 2 times: 8am or 10am for P$50 each. You meet outside the Los Frayes hotel. We walked down to the pier to join a multitude of people gathering to get onto the boats. En route we stopped to view the ‘candelaria’ … a pre-incan carving on a hillside. Before making it to the Ballestas Islands. Ballestas is known as “the poor man’s Galapagos”. There are plenty of birds to see. There are plenty of seals to see. Again, you arrive in Paracas late. So, you tend to spend your first evening in a waterfront restobar. I suggest that you only stay this 1 night. Do Ballestas at 8am. Do the National Park at 11am. Spend a few more hours on the waterfront. Catch the 5:30pm Peru Hop bus on to Lima. The Single Decker Peru Hop bus leaves Paracas at 5:30pm. Pick up is from outside of the Los Frayles hotel. En route to Lima, you stop off for a free tour of the Secret Slave Tunnels at the Hacienda San Jose, El Carmen. You arrive at about 7pm. Our bus was full, so there were 2 groups to tour the tunnels. They were a stark reminder of our disgraceful past. The bus arrives in Lima after 11:30pm. Peru Hop drop people off at various hotels that lie close to their main route through the city. For other hotels, they organise a free shuttle bus. We booked ourselves into a 2 bedroom apartment in Barranco. We paid US$50 per night for the whole apartment. 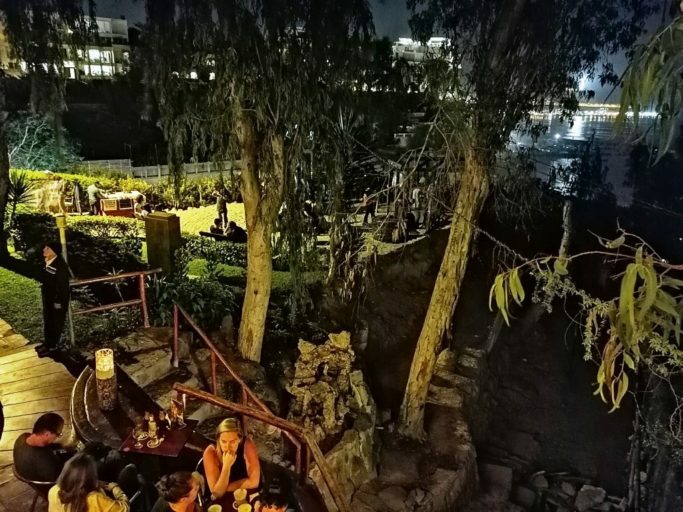 Barranco is ‘the up and coming’ tourist destination in Lima. Barranco is famous for the ‘Bridge Of Sighs’. Here, you find lots of ‘tourist-priced’ restaurants. On arrival, we had a problem. It was midnight and we had booked into an AirBnB. We had to pick the keys up from the owner in Miraflores. We got Peru Hop to drop us off at one of their ‘named’ Miraflores hotels located nearby. As luck would have it, they put us into a shuttle bus. The driver agreed to wait for us whilst we collected the keys and we paid him extra to take us back to Barranco. Peru Hop is an excellent, easy, and safe way to tour Peru and Bolivia. 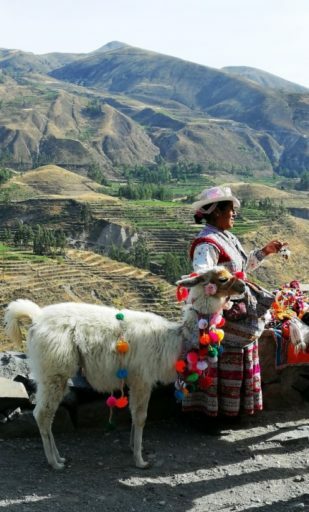 Peru Hop have selected an excellent set of destinations … each with something ‘special’ to do or see. However, I think that they could do better on some of their bus timings and on seat allocation. Long distance over-night travellers should be allocated the downstairs Business Class seats. The section from Arequipa to Nazca / Huacachina is a minimum of 10 hours … this should be an overnight leg. They also need to adjust bus times so that you arrive in Lima well before midnight.